If you ask any Istanbulite, when their favorite time of the year is to enjoy the city, they will undoubtedly say that it is during holidays. Suddenly the daily mayhem comes to a stop as most of members of this city take the opportunity to vacation out of town with their family or at a seaside location. For those of us who won't be leaving the city however, there are still a number of ways to enjoy this holiday weekend. Not only is it an opportunity to discover the parts of the city you have not yet ventured to, but you can also rest assure with the knowledge that you will be enjoying the city at its heyday for most. A trip to the Prince's Islands is always a welcome respite no matter which one or how many you visit. Even the journey to get there, an approximate one-hour ride aboard a ferry from numerous destinations in Istanbul, offers a welcome respite from the greater city. Burgazada, the third largest of the Prince's islands at two kilometers' width is less popular with the crowds than its larger neighbor, hence named Büyükada, but this is definitely part of its charm. Once you step off the boat, the silence of no cars, which are not permitted on the island, and instead the sounds of horse carriages and bikes, coupled by spectacular greenery and views is reason enough to feel a world away from the city. Burgazada also has a rich history and the remnants to prove it, including a series of Byzantine monasteries, Greek Orthodox churches as well as a synagogue and mosque all attest to the multicultural history and community on the island. Rent a bike, take a horse carriage or simply walk the island to head to Madam Martha Koyu, a long sandy stretch of beach still left in its natural state with rustic facilities. Then, after you watch the sunset the island is famed for, head to Cennet Bahçesi, a former dance hall that has since become a live music venue for up and coming alternative acts from Istanbul. Every summer, Cennet Bahçesi hosts Paradisos Sessions; a special concert series held every other Saturday and organized by none other than Taner Öngür, the bass player for the legendary Anatolian rock group Moğollar. I bet you didn't know that Istanbul has its very own Japanese garden by the name of Baltalimanı Japanese Garden. Located in Emirgan, public buses along the coast serve this destination and there is even the Emirgan ferry station nearby, which means you could hop on a ferry from Bebek, Kanlıca or even Anadolu Hisarı and simply stroll to the park. Inspired by the Chofu Garden, on the Kanmon Straits of Japan, this Japanese garden was prepared in 2003 by landscapers who flew out from Shimonoseki and is meant to further feelings of fraternity between the two friendly nations. The garden is filled with traditional Japanese cherry trees and maples as well as other native plants and flowers, a pond, statues and pagodas. In 2010, a new rose garden was also added. After enjoying the peace and serenity of this park that makes one feel they have been transported, then check out the rapidly developing Reşitpaşa neighborhood, with its hip and happening gourmet cuisine scene. From there, walk along the coast to the Sakıp Sabancı Museum, a private fine arts museum that hosts collections devoted to calligraphic art, paintings from the Ottoman era and historical religious and state documents. On Sunday, June 17, the final day of the "Feast of Sugar" holiday, which also doubles as Fathers' Day, entrance to the Sakıp Sabancı Museum will be free for all, making for an excellent opportunity to check out this impressive museum if you have not visited it yet. Located less than an hour away from the center of the metropolis, Kilyos is a popular seaside resort located on the northern Black Sea coast of Istanbul. There are a number of beach resorts that have become popular, however none have surpassed that of Suma Beach, a beach club that hosts electronic music parties that go on into the wee hours of the night. Transfer shuttles will pick you up from Taksim at all hours of the day and drop you off in Taksim, Maçka and Levent on the return home, making for a convenient escape from the city. At Suma Beach, you will definitely get your fill of the beach, sea and summer party vibe as the energy level increasingly thrives as the night goes on. There will be electronic music parties on both Friday and Saturday night to get your groove on. However, the beach is also a joy during the day and also boasts Turkey's sole surf school, in which you can learn to ride the waves of the semi-ferocious Black Sea. Doubling as a popular kite surf spot, if you don't want to embark on lessons, just witnessing the surfers as they sail through the sky and cruise over the sea is enough of an adrenaline rush for anyone, especially if you have never watched such a spectacle before. Why not witness the city from the sky as the sky is the limit when it comes to enjoying all Istanbul has to offer. Every Sunday, Istanbul Helicopter Tours organizes 15-minute group flights for seven passengers that range from 75 euros to 175 euros, to ride co-pilot. You can join alone or come as a group for this great opportunity to see the city and enjoy an experience aboard a helicopter. The flight takes off at 1 p.m. from Ayazağa, Maslak and returns to the same spot, so you can easily combine a helicopter flight with a long walk by foot of the magnificent and neighboring Belgrade forest. 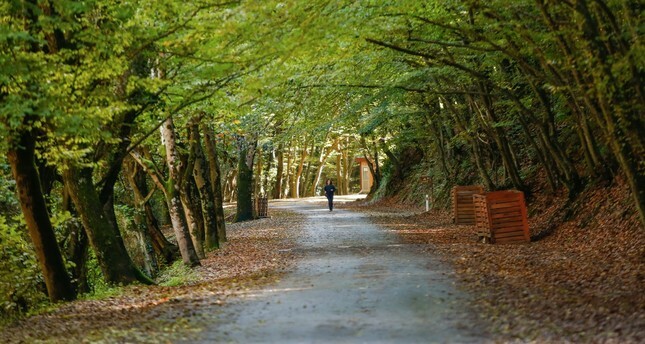 The Atatürk Arboretum, is a spectacular area of the forest that houses 1,500 varieties of fauna as well as a lake, while at the other end of the park, you could easily jump on public transportation or get in a taxi, to make sure you experience the best this magnificent forest has to offer. Many a visitor to Istanbul can get stuck caught up on all the European side has to offer, after all it harbors the historical, business and shopping centers as well as has the grandest parks and nature reserves in the city. However, the Asian side, a simple 20 minute maximum ferry-ride away has a lot of interesting neighborhoods that are wonderful representations of the multi-facets of Istanbul. Start the day with breakfast in Çengelköy, by purchasing a börek pastry from the famous Çengelköy Börekçisi and sitting down to enjoy it with a tea at the Tarihi Çınaraltı Çay Bahçesi. Named after the humongous sycamore tree it is centered around, this experience is one filled with nostalgia for any an Istanbulite and you should try it to. Next, head to Kuzguncuk, an area that has still retained a neighborhood feel with spectacular colorful wooden Ottoman architecture that is now being turned into some of the most creative and enticing food, arts and gift shops. From there, you are just a short bus ride away from Kadıköy and its colorful Yeldeğirmeni neighborhood, which if you haven't wandered through yet is a must as it is an open-air museum of sorts for building murals. Every year, the Mural Istanbul Festival brings out leading graffiti and mural artists to adorn the walls of buildings in the neighborhood. This year's festival will take place from June 20 to July 8 and you can watch the masters painting their murals live during those two weeks.